Lagoon Lodge is a lovely thatched roof property situated in Milnerton, close to highways and the R27. The Langholm Hotel is the only privately-owned 3 star hotel in Walvis Bay and is the ideal location for the corporate traveller and tourist alike. Join us for a unique experience at the Lodge at Atlantic Beach on the Cape`s Premier Atlantic Beach Golf Estate. Lotz of Joy Guesthouse is a 3 star guesthouse in the Northern Suburbs of Panorama- just 20 minutes away from the city centre. Right in front of the very elegant Parc Monceau, at only a few minutes away from the Champs Élysées, the location of the hotel is ideal if you want to discover and experience Paris. L'Habitation has been designed as an old colonial plantation house and is situated close to the beach on Cerf Island in the Marine National Park. La Digue Island Lodge provides some of Seychelles' warmest hospitality and an unequalled approach to small island luxury. Situated on the border of the Orange River between the Free State and Eastern Cape, this exclusive guesthouse, La Riviera offers a sanctuary for the soul. Uninterrupted views over the reserve and yet only a 2Km from the city centre - the ideal base for discerning executives or romantic getaways. 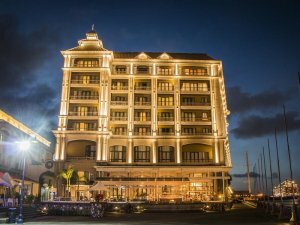 The only 5-star business hotel in Mauritius, the Labourdonnais Waterfront Hotel exudes refinement and exclusivity. The Laico Atlanitc Hotel & Resort is located along a charming 50km coastline of The Gambia, just minutes away from the centre of the country's capital Banjul. The LAICO Ouaga 2000 is a 5 star hotel located in the heart of the new administrative centre of Ouagadougou. Set in the macnificent Maluti Mountains of the Eastern Free State is the quaint village of Clarens. All the magic of a Mediterranean marina and a world-class golf resort, just 20 minutes from Kampala and Entebbe. Our small luxury hotel on the banks of the Swartvlei Lagoon offers cocooning of the highest order with nine luxurious bedroom suites, a fine dining restaurant, luxury spa and friendly staff. Lalapanzi Hotel is a beautiful old tudor-style English Hotel, situated on the N1 in the Bandelierkop area.